Free Donar MP3 Recorder Download from FilesPack.com! 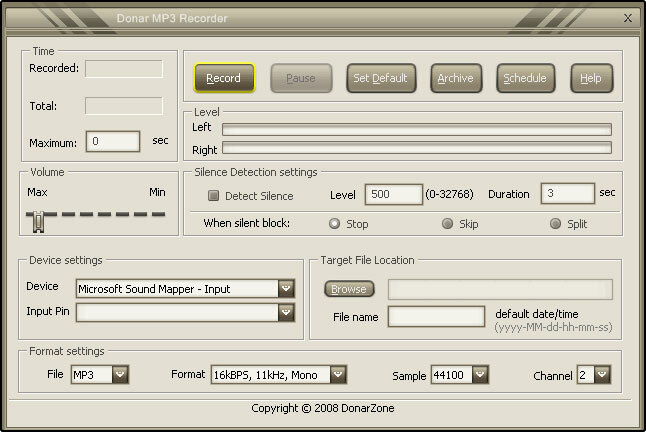 Donar MP3 Recorder is a flexible sound recorder software designed to capture any sound in real-time. It is a very easy and reliable way to record any sound whether voice from microphone, internet streaming audio, or music played by Winamp, Windows Media Player, Quick Time, Real Player, Flash, games, etc. This application provides direct support for RealPlayer, Winamp, Windows Media Player ,Power DVD ,Flash, Quick time and many others. You can save your recorded files into various popular types of format such as MP3, WMA, OGG, VOX, AU, AIFF. Donar MP3 Recorder offers high quality recordings and a neat-looking, user-friendly interface. Donar MP3 Recorder is packed with a variety of features including a recording scheduler - the best way to easily record the Internet Radio shows you love and total control over the recording quality meaning you get to make your own adjustments like selecting frequency, bit rate, sample size, number of channels and volume of recoding and, of course, the type of format you want your file to be saved as. In addition, the time available for recording depends only on the amount of space on your hard disk. The program allows you to name the files you record and select the directory you want them to be saved in. You can also use the Archive button in the main window of the program to get a quick view or browse of all recorded files; at the same time, you can remove any unwanted files or play recorded files in media player. If you make any settings you want to keep you can easily save them by default. Another great thing about Donar MP3 Recorder is that is easily configurable you can set it to start automatically on every system Restart. You are just required to select an option Run at Startup in the tray menu triggered by a right click on the Donar MP3 Recorder tray icon. If Run at Startup is on, a check mark will appear on the left of this menu item. You can free download Donar MP3 Recorder 1.6.5 now.